Shea butter is a popular ingredient in many natural skin care products since it is moisturizing and packed with vitamin A. From blemishes to wrinkles, it has so many benefits that your skin will love! 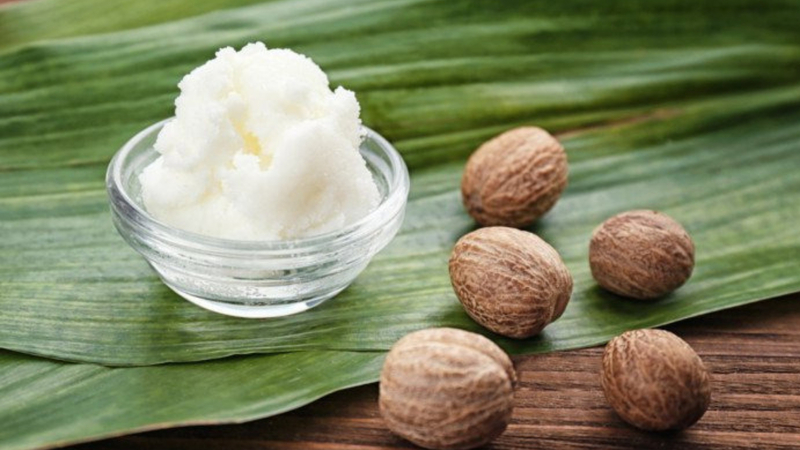 Shea butter comes from nuts found on the Shea (Karite) tree which grows in Africa. The outer shell of the nut is removed and then the nut is crushed and slowly roasted into butter. The butter is kneaded in a basin of water so that the fatty acids are separated (the fatty acids are the good stuff that make shea butter so amazing)! As the oils float to the top, they are removed and boiled to evaporate any excess water. What is left is the shea butter, which is taken from the top of the pot and set aside to cool/harden. Even though shea butter may seem like a new trend, it is not a new discovery. The skincare and healing properties of this skin superfood have been used for thousands of years tracing back to ancient Egypt where it was used to protect the hair and skin from the sun as well as the from the hot dry winds of the African deserts. Moisturizing: Shea butter provides hydration to your skin, making it a great moisturizer to give your skin a healthy glow! It’s great for all seasons, from soothing sunburns in the summer to relieving dry, itchy winter skin. Anti-Aging: In its raw form, shea butter aids in tissue cell regeneration and has been shown to boost collagen production. People who use shea butter long term have reported that it softens and strengthens their skin and also helps in reducing wrinkles. Healing Properties: If you are looking to reduce stretch marks, cellulite or scarring, shea butter has incredible healing properties that can help reduce the appearance of these three skin conditions. Vitamins: Shea butter is naturally rich in vitamins A, E and F. The vitamin A found in shea butter also gives it a natural UV protection of about 6 SPF. This combo of vitamins makes shea butter nourishing for your skin. If you can’t tell by now, we love shea butter and its benefits! Our Body Cream is made from shea butter, vitamin E, coconut oil and sweet almond oil…everything yummy your skin adores! We put it in our Natural Deodorant as a soothing ingredient for your skin along with aloe vera. And of course we put shea butter in Ambre Glow! And don’t forget your lips. Ambre Blends Lip Remedy soothes and heals dry, chapped lips with the help of shea butter. We think you’ll love shea butter as much as we do once you try using it in one of our body products. And you never have to worry about harsh chemicals or synthetic scents since our products are natural and organic!